New York City Mayor Bill de Blasio announced legislation today guaranteeing two weeks of paid time off for all workers. If de Blasio's proposal is approved by the City Council, New York City would become the first and only American city to require paid vacation. The proposal is expected to impact at least 500,000 people, according to the mayor's office, but would exempt businesses with fewer than five employees. "To be the fairest big city in America, New Yorkers can't be forced to choose between bringing home a paycheck and taking time off to just disconnect or spend time with loved ones - that choice ends with Paid Personal Time," de Blasio said. Among those the mayor's office said the policy would benefit are 180,000 workers in professional services, 90,000 workers in the retail sector, and 200,000 in the hotel and food service industries. "Every other major nation recognizes the necessity of Paid Personal Time," de Blasio said. "We as a country must get there, and New York City will lead the way." Some critics called the mayor's proposal costly for businesses. "Workers in New York City already earn up to a week of paid time off. And while giving an additional two weeks paid vacation sounds like a nice idea, it has a significant cost for businesses, especially at a time when vacant storefronts plague our city streets and employment growth at city restaurants has gone flat, due in large part to other government mandates," Andrew Rigie, the executive director of the NYC Hospitality Alliance, said in a statement. The Paid Personal Time proposal came one day after de Blasio announced a plan to provide health care for all city residents. 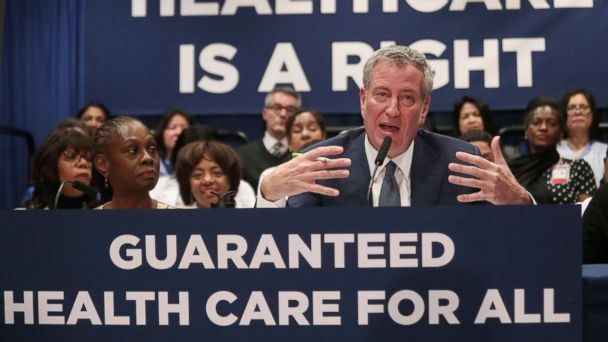 On Tuesday, de Blasio unveiled NYC Care, a program that will guarantee health care for the estimated 600,000 New Yorkers who do not currently have health insurance, including undocumented immigrants, according to the mayor's office.